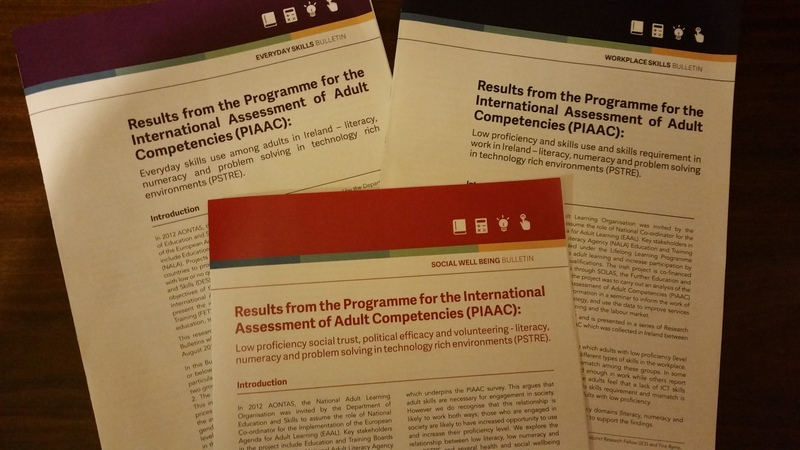 Since 2013, Ireland’s NALA has undertaken, and recently published the outcomes of, further analysis of the last round of PIAAC data on adult literacies. NALA were interested in interrogating connections which would allow better understanding and target provision. They explored the three areas of Literacy, Numeracy and Problem-solving in Technology Rich Environments (PSTRE): in workplace literacies; in everyday literacies; and in social trust, political efficacy and volunteering. Level 1 and below were compared to Level 2, and further differentiated by age group, gender, graded (un)employment status, sector by skills level, and highest qualifications. PIAAC level 1 equates more closely to UK Entry 3. The skills themselves are assessed on typical tasks. It is notable that levels appear not to have advanced since the IALS survey in 1997. There is considerable emphasis on the social integration, participation and empowerment impact of skills, as well as the transformation effect on financial well-being and families’ generational attainments. In workplace literacies, the analysis was interested in workplace skills requirements and mismatches, earnings and job satisfaction. Broadly, those at level 2 were using skills, performing in their jobs, and more likely to be rewarded with higher earnings. This trajectory maintains across the life course, peaking in middle age, and ‘up’ occupations and skills levels. Higher skills were associated with having the PSTRE needed for one’s job. An interesting feature was that those with numeracy at or below level 1 were particularly aware of a lack of PSTRE impacting on their work performance, but not in respect of improving their numeracy skills, and while feeling that their work did not provide sufficient challenge. Poor skills correlated with lack of employment. All levels showed significant awareness of ‘needing more training’. While confirming much accepted wisdom, these results also strongly indicate for utilising PSTRE to attract participation and in parallel scaffold numeracy skills in the major social target group of those with numeracy at or below level 1. They also further substantiate the rationale for lifelong learning programmes. As they conclude, productivity does not necessarily decline with age: skills and qualities acquire through experience. There appears to be a positive feedback loop between having skills, using skills and benefiting from skills, whether in employment, civic engagement or health. Another major area of PIAAC data was in the areas of social trust, political efficacy and volunteering, which showed positive correlation with higher skills levels, which in turn were associated with better self-reported health status, volunteering and parent’s educational levels. The most notable findings here linked level 2 skills to political efficacy, and level 2 PSTRE to social trust in particular. Again, focussing on developing PSTRE appears to be a window to wider benefits. The third theme looked at skills and proficiencies in home lives. Similar results were found where those with higher skills were more likely to use them; they were also more likely to be protected from the decline associated with longterm unemployment. Higher education levels are associated with higher skills usage, as is being female in literacy, while in PSTRE, numeracy and level 2 reading, the genders are equal. It was noticeable that, unlike skills in work, literacy and numeracy skills show a downward trajectory with age in the home environment, and writing in particular. PSTRE does not show this trend. Numeracy shows a higher proportion of people at both levels who use them infrequently. For those at level one and below this is striking in those aged 55 and over, and for those with lower levels of education. Across all skills the differences are exacerbated at the lower end of the educational spectrum, and narrow near the top. It is interesting that a level 2 in both numeracy and PSTRE, short- and long-term unemployment is associated with higher skills usage. The results were launched to a full audience in Dublin on the 7th October 2015 at ‘Invitation to the launch of a report providing an in-depth analysis of PIAAC with participants at or below Level 2 funded through the European Agenda for Adult Learning (EAAL) and hosted jointly by the National Adult Literacy Agency (NALA) and AONTAS. Berni Brady, National Coordinator EAAL, introduced the day by outlining how politically, Ireland has moved with the EU from engaging in early publicity and dialogue with main stakeholders via a steering group, to having literacy and numeracy underpinned by statute in adult and further education in the summer of 2013. The current agenda is clearing up some of the outstanding issues which SOLAS, the Further Education and Training Authority in Ireland, had not been able to resolve previously. There is still a focus on workplace learning, which integrates social and other skills. Almost half of the adults seeking basic skills are in employment; while about seventeen percent are long-term unemployed. Regional literacy and numeracy strategies are arranging Education and Training Board events to strengthen ties with the ETBs. Dr. Sarah Gibney, Adjunct Research Fellow UCD, highlighted the social implications of adult literacies and in particular the clear links between parents’ educational levels and their grown children’s. She also pointed to the impact at work and job satisfaction being linked to skills levels. Marian Lynch, National Adult Literacy and Community Education Coordinator, emphasised the change and penetration of technology into every day lives and jobs as a major societal change. However, she also drew attention to potential issues of ‘over-accreditation’ in entry level work such as carers and bouncers, and the role of community education in wheedling out social problems.Professor Mark Morgan, TCD, introduced new connections in psychology between engaging cognitive capacity, development via literacies, and social outcomes as he described a ‘cognitive reserve’ protected by literacies use, bilingualism and other engagements which provide protection against cognitive decline in old age. Finally, Keith Pollard, Mandate Trade Union, discussed communication as a basic skill, the success of union learning initiatives with low paid workers, and the new training centre at Croke Park stadium, Dublin. While the travel up and down the country was a bit much, lunch was delicious and the venue comfortable. At the end of the afternoon, the seminars around each theme were summarised and Inez Bailey, Director at NALA, emphasised the ongoing multi-partite activity occurring across Ireland, the value of the development trajectory in play, and the sustained contributions of all stakeholders to driving the agenda forward focussing on society’s neediest: the low skilled. Furthermore, adults with literacy and numeracy difficulties benefit from training by up to three times the average (Kelly et al, 2012). It is worth taking away from the day that PSTRE appears to be a window to resolving a range of issues; and that everyday literacies usage needs support not to decline with age outside of employment. I was sorry not to have had time to revisit the Museum of Modern Art late afternoon, but did take a stroll through the grounds on my way back.